Suppose your neighborhood had one popcorn store, and then a few others began to open in the same location. What would that mean for popcorn prices? What would that mean for the different types of popcorn offered? Faculty members from the University of Delaware’s Center for Economic Education and Entrepreneurship (CEEE) help area teachers explore questions such as these in their classrooms through the Mini-Society program. This self-organizing, experience-based approach to instructing students includes lessons on entrepreneurship, economics, government, career opportunity, consumer issues and values. Through Mini-Society, created by former UCLA professor Marilyn L. Kourilsky, young students explore the roles of civil servants, entrepreneurs and consumers, and open their own businesses for shoppers on Market Days. They explore economic concepts such as supply and demand, goods and services, and the monetary system. Each summer, the CEEE offers an intensive training so that teachers new to the program are fully prepared to instruct in the curriculum. 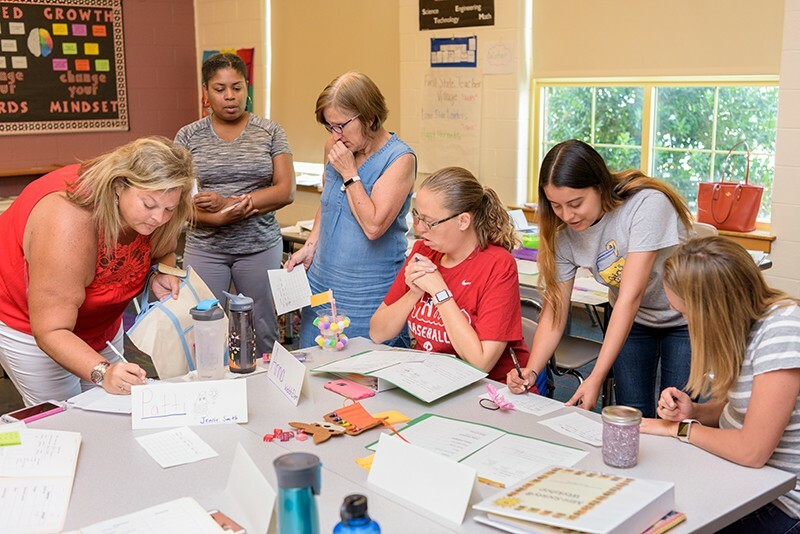 Through three days of professional development, these teachers learn to serve as facilitators so that their students, through trial and error, can learn basic economic concepts while creating their own micro-economy in the classroom. Bonnie Meszaros, associate director of CEEE and instructor for Mini-Society, discussed how important it is for students to participate in Mini-Society and how the skills learned during the program will apply in many different aspects of their education. Erin Boettcher, a teacher at Wilbur Elementary school and graduate of the CEEE’s Master of Arts in Economics & Entrepreneurship for Educators (MAEEE) program, has been implementing Mini-Society in her own classroom since 2005. She now instructs teachers on Mini-Society with Meszaros and said she believes teachers benefit as well as students when they implement the program at their own schools. Heather Brooks, a library and reading teacher for grades one through four at The Tatnall School, said she loves the way her students can use all of the subjects they’re learning in school and apply them during Mini-Society. Brooks added that students learn important lessons that will carry them through college with Mini-Society, as the integrated structure of Mini-Society teaches students both important financial lessons and personal lessons. Meszaros said students can apply these lessons to real-life problems.